Jesus of Nazareth is the writing on the life and teachings of Jesus Christ by Pope Benedict XVI, published in three volumes. 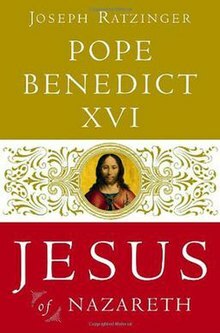 The first volume, Jesus of Nazareth: From the Baptism in the Jordan to the Transfiguration, authored by Benedict following his ascension to the papacy, it was published by Doubleday in 2007. In the book's introduction, the pope explicitly states that the treatise is in "no way an exercise of the magisterium," but rather an "expression of his personal search for the face of the Lord." It is not, however, primarily meditational or part of the genre of "edifying literature", but more directly the book of a theologian, concluding the scientific work of Prof. Ratzinger. The ten chapters cover the bulk of Jesus' public ministry, encompassing subjects and events such as Christ's baptism at the hands of John the Baptist, the Sermon on the Mount, the meaning of the parables, the Calling of the Twelve, the Confession of Peter, and the Transfiguration. The book stops short of Jesus' entry into Jerusalem and subsequent Passion and Resurrection, which are the primary topics of the second volume, Jesus of Nazareth: Holy Week: From the Entrance Into Jerusalem To The Resurrection, which was published on March 15, 2011. The third and final volume, Jesus of Nazareth: The Infancy Narratives was published on November 21, 2012. ^ "Benedict XVI Working on Volume 3 of Jesus of Nazareth". Zenit. Archived from the original on September 27, 2012. Retrieved February 22, 2012. This article about a biographical or autobiographical book on Christian personalities is a stub. You can help Wikipedia by expanding it.